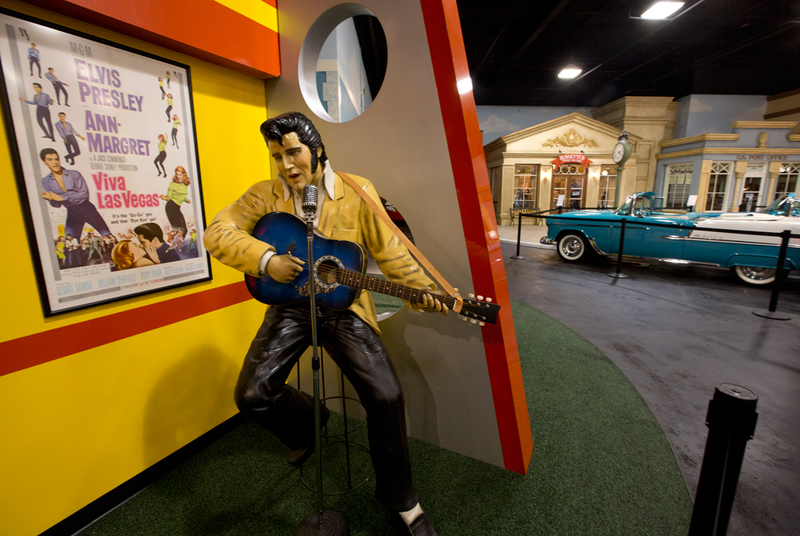 Elvis Presley lifesize model in a private auto museum in North Palm Beach, Fla. John Staluppi has spent a lifetime selling cars, so successful in his trade he boasts more than two dozen dealerships and more sales than he ever could count. But even he has never seen a sale like this. Staluppi is liquidating his Cars of Dreams Museum and its 115 collector vehicles in an auction Saturday. The Batmobile, the Evel Knievel motorcycle, the lines and lines of perfectly shined cars, all of them will be gone. "I'm starting to get sad," he admits. AP Photo/J Pat Carter. BLENHEIM, ON.- RM Auctions, the worlds largest collector car auction house for investment-quality automobiles, concluded is 2012 calendar on a high note in Florida this past weekend (December 1), generating more than $11.5 million in sales with 100 percent of all lots sold at its John Staluppi Cars of Dreams Collection sale in North Palm Beach. The result of a decade of dedicated collecting by respected collector and successful entrepreneur, John Staluppi, the single-day auction presented a magnificent range of American automobiles and memorabilia before a standing-room only crowd. Capturing the attention of the global collector community, bidders hailed from 10 countries from around the world, including as far away as Brazil, Germany and Australia. On a national level, bidders represented 42 states across the United States. The automobile offering comprised a wide variety of some of the finest, rarest and most desirable American automobiles ever produced, with a strong emphasis on convertibles and performance cars. Headlining the list of 113 automobiles on offer was a magnificently restored 1956 Cadillac Series 62 Convertible. Considered near the pinnacle of Cadillacs post-war flamboyance, the brilliant Mandan red convertible drew lively bidding, eclipsing its pre-sale estimate of $150,000 - $200,000 to sell for a strong $299,750. The remarkable sales price represents a new world record for a 1956 Cadillac Convertible sold at auction. In addition to the sale-topping 56 Cadillac, other highlights from the same marque included a 1958 Cadillac Eldorado Biarritz Convertible for $206,250 and a 1960 Cadillac Eldorado Biarritz Convertible also for $206,250  a new auction record for the 1960 model year. Other notable sales included a rare Acapulco Blue 1968 Shelby Mustang GT500-KR Convertible which garnered an impressive $264,000; a 1958 Chevrolet Bel Air Impala Custom Hardtop Coupe, equipped with an 840 bhp, LS-9, supercharged V-8, which almost doubled its pre-sale estimate, selling for $198,000; and a 1966 Ford Mustang Convertible which also exceeded expectations, realizing a strong $78,100. In addition to the automobiles, the auction also featured an eclectic assortment of memorabilia. Leading this segment of the sale was a historic 1918 Herschell-Spillman 32 Carousel which spurred a lively bidding war, eventually selling for a terrific $460,000 to applause from the crowd. Other notable memorabilia highlights included a one-of-a-kind large-scale Lionel train layout, measuring approximately 30 feet long by 15 feet wide and nine feet tall, another lot that well-exceeded estimate, bringing $103,500; and a fully-functioning, authentic Cretors Antique Popcorn Wagon which also drew spirited bidding, more than doubling its pre-sale estimate at $63,250. The John Staluppi Cars of Dreams Museum sale capped off a record year for RM Auctions which, in addition to its annual catalogue sales, included five standalone single-vendor auctions illustrating RMs expertise in the marketing, cataloguing and presentation of private and estate collections. I chose RM Auctions as they are one of the most professional companies in the auction business. No other company couldve offered my collection the way RM did. From start to finish, the job was done to perfection. I have no hesitation recommending them to others, said John Staluppi following the sale. With a very positive forecast for the New Year, RM kicks off its 2013 auction season, January 18 in Phoenix, Arizona, closely followed by the presentation of the Bruce Weiner Microcar Museum Collection  the worlds largest collection of the worlds smallest cars  February 15  16 in Madison, Georgia.